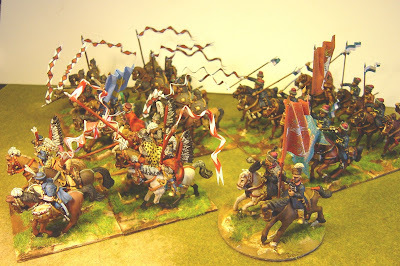 I’ve been rebasing some of the Polish Cavalry for this project. Originally I had planned to have all my cavalry regiments at a strength of 12 figures because TAG sells them at a discount in twelves and because I did not really understand how the Poles fielded their cavalry. But having seen some OOBs I’ve noted that strengths for many regiments, but particularly those of the Hussaria, were often just a few hundred and that the most obvious thing about a Polish army of this period was the sheer irregularity of it all. So I’ve cut some of these Hussar regiments from 12 figures to six (my figure scale is 1:50) so they will just be 300 men strong. I’ve also done the same with the Pancerni. Cutting some regiments to six has meant rebasing them all. I’m showing a schematic drawing which I normally do for all projects so I can see the armies in a diagrammatic form and record the progress of painting. I’ve also been adding lance pennants to some other regiments too. 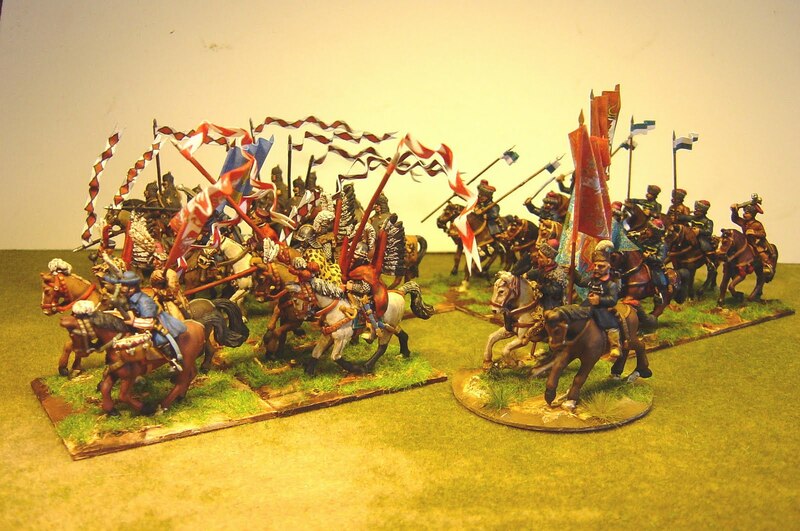 I don’t know why I had limited them to just the Hussars but now all my Pancerni regiments will have them too. Even the Levy will have smaller pennants too. I’m looking here at visual appeal only and not historical accuracy. The picture shows some of the new cavalry. The other thing you may have noticed is that the Russians seems to have disappeared and the Ottomans have arrived. Well, I’ve sold the Russians except for the Guard Cavalry Jiltsi unit I had done, which I had a horrible accident with. They went crashing to the floor and now lie in a box, a pile of bits forlornly looking for repair. I must be a very fickle wargamer if I can drop an army like that! Now I have always wanted an Ottoman army being one of the most colourful and versatile armies available. Versatile because they will both be able to fight the Poles in this timescale but also the Austrians in the mid 18th century.I can't wait to start painting them! Congrats on the figures, they look stunning!! !